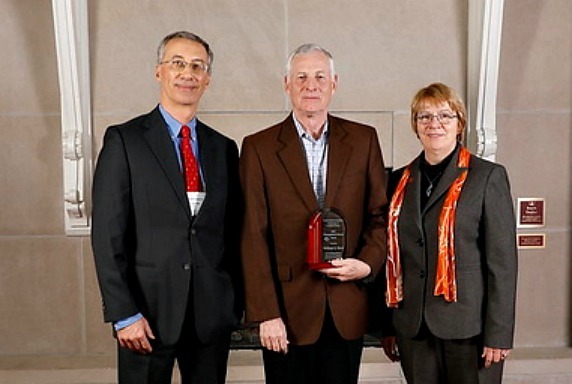 Ames, Iowa—Iowa State University's Department of Computer Science honored William G. Bock with the Department of Computer Science Distinguished Alumni Award at an honors and awards ceremony on October 26, 2017 in Ames, Iowa. The award recognizes outstanding alumni from the Department of Computer Science in the College of Liberal Arts and Sciences at Iowa State. Bock serves on the Silicon Labs Board of Directors and on the boards of a number of venture-backed private technology companies in Texas. He is an advisor to two venture capital firms and an NYC-based financial and M&A advisory firm. He is also Chairman of the Entrepreneurs Foundation of Central Texas, an organization he helped co-found in 1999. Prior to his retirement in 2016, he served as President of Silicon Laboratories Inc., a public 3 billion dollar market cap semiconductor company headquartered in Austin, Texas. He also served as the company’s CFO from 2006-2011. Prior to Silicon Labs, Bock worked in venture capital, primarily with CenterPoint Ventures. He previously held senior executive positions with three successful start-ups and he began his career at Texas Instruments. He has, as an executive or Board Director, participated in five Initial Public Offerings and over a dozen M&A transactions. Bock received his B.S. degree in computer science from Iowa State University in 1973, and went on to attain his master’s degree in Industrial Administration from Carnegie Mellon. He was inducted into the Austin Technology Council’s Hall of Fame in 2015 and has received several other recognitions for his work.